The Phillies ended a season-worst six-game losing streak by beating the Baltimore Orioles 9-6 on Friday night. Shane Victorino homered and drove in five runs during Friday night's game. Jim Thome felt right at home, in the cleanup spot, in the DH slot. Thome broke loose for the first time this year, Shane Victorino homered and drove in five runs, and the Philadelphia Phillies emphatically ended a season-worst six-game losing streak by beating the Baltimore Orioles 9-6 on Friday night. "You always want to get at-bats. You always want to contribute," Thome said. Thome doubled twice, legged out an infield hit and got his first RBI of the season. Mike Fontenot also homered to the delight of a Camden Yards crowd full of spirited Phillies fans. Beset by back problems, the 41-year-old Thome came off the disabled list this week. He had been just 2 for 20 with 11 strikeouts overall. Thome is the majors' career leader in interleague home runs. He's spent a lot of time as a DH, and figures to get plenty of chances on the Phillies' nine-game trip to Baltimore, Minnesota and Toronto. "I've always enjoyed interleague play. It gives you a chance to see different clubs, to go to different places," he said. "It gives you a good chance to see where you are, where you stand with other teams." Chris Davis and J.J. Hardy homered for the Orioles, who lost for the ninth time in 12 games. This was interleague ball, purely AL style. Boppers ruled on a night when even ninth-place batters such as Fontenot became dangerous. The Phillies hit for the cycle, and then some, in the second inning alone, a homer, a triple, three doubles and a single. Philadelphia scored six times, with Fontenot's two-run shot coming right after his foul fly fell beyond Hardy as left fielder Endy Chavez backed off. By the fourth, it was 9-4 and the teams had already combined for 10 extra-base hits. 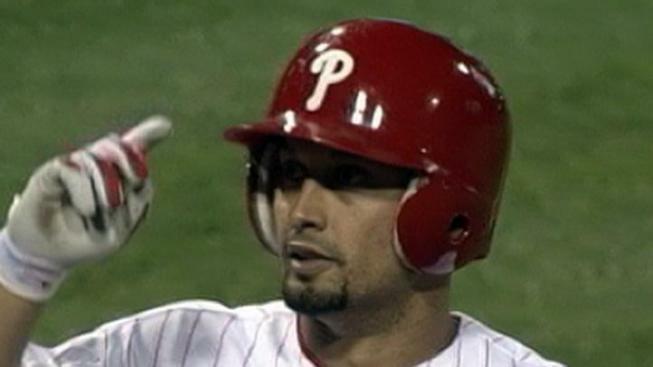 Victorino had homered, doubled, singled and matched his career high for RBIs by then. "We came out hitting, right off the bat," Phillies manager Charlie Manuel said. A day after Manuel said his slumping team wasn't scaring anyone, his hitters took those words as motivation. Of course, it helped that the Phillies had a designated hitter who really was a DH, rather than a bench guy. Thome's dribbler past Jake Arrieta (2-8) went for a two-out single in the first inning when shifted second baseman Robert Andino had no chance to make a play from short right field, and set up Victorino's RBI single. Thome lined a ground-rule double to right-center in the second that let Juan Pierre score the 1,000th run of his career. Thome doubled again in the fourth and scored on Victorino's eighth homer for a 9-3 lead. Arrieta, the Orioles' opening day starter, lost his sixth straight decision. He was tagged for career highs of nine runs and 11 hits in four innings. "Going over the game in my head and trying to analyze things. I'm probably overthinking things," he said. "I'm just kind of lost right now. "To go out in front of 40,000 and having a whole clubhouse counting on you, then to go out there and give it up like that, it's pretty frustrating," he said. Joe Blanton (5-6) hung around for 6 2-3 innings and gave up five runs, stopping a skid in which he had been pounded while going 0-3 over four starts. He has allowed 11 home runs in his past five outings. "The way things have been going for me, I'm not even thinking about runs," he said. "I'm just trying to survive." Jonathan Papelbon pitched the ninth and remained perfect in 16 save chances. Davis hit an RBI single in the second and Andino added a two-run double. Davis had a leadoff homer in the fourth. Hardy greeted reliever Michael Schwimmer with a two-out, two-run homer in the seventh. The crowd of 40,459 was the Orioles' largest since opening day and was boosted by a throng of fans decked out in Phillies garb. With Citizens Bank Park sold out for the last 235 regular-season games, plenty of Philadelphia rooters made the short drive to see their team's first visit to Baltimore since 2006. When Carlos Ruiz hit an RBI single in the second for a 7-0 lead, there was a collision of sound, the Phillies fans were yelling his nickname of "Chooooch" while the Orioles' backers were simply booing. "It felt like a good atmosphere," Blanton said.